The park's family campground is located in a wooded area near Snow's Cut. There are 69 campsites with no hook-ups, including two wheelchair-accessible sites. Ten campsites have full hookups (water, electric and sewer), including one wheelchair-accessible site. Each site is equipped with a picnic table and grill or fire ring. Drinking water and restrooms with hot showers are located nearby. 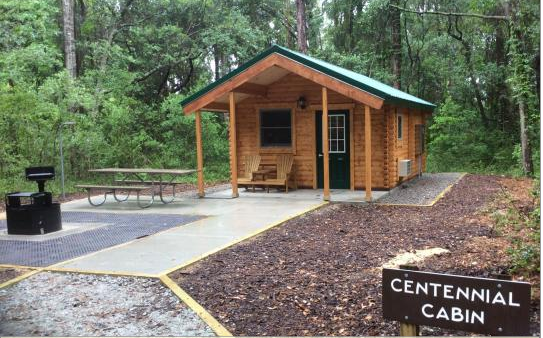 In addition to the 79 campsites, the park has four camper cabins located in the family campground. These camping cabins sleep six people in two rooms, one with a double bed and one with two sets of bunk beds. Each cabin has electrical outlets and a heating and air-conditioning unit. Outside each cabin, there is a picnic table, charcoal grill and a fire ring. Drinking water and restrooms with hot showers are located nearby. No smoking is allowed in any of the cabins. Centennial Cabin is wheelchair-accessible. Animals are not allowed in the cabins or cabin area, with the exception of service animals. Park gate is locked daily at posted closing hours. Vehicle access after gate closing and before 7 a.m. is restricted, except in an emergency. There are also two camping areas for organized groups located along Swamp Trail and are available by reservation only. Site #1 accommodates up to 26 people; site #2 accommodates up to 40 people. These areas include two picnic tables, grills/fire rings and pit toilets. Water and shower facilities are not available. This area is accessible only by foot and is located approximately 400 yards from the Flytrap Trail parking area. Reservations can be made by contacting the park marina office.